At the lavish Vegas Spins Casino, you can enjoy Hotline slots via your mobile, desktop or tablet. Provided by NetEnt, this slot game is embedded with 5 reels and 30 paylines to spin! Bar the slot grid, you also have an array of bonuses and features to benefit from. These are; free spins, respins, expanding wilds, sticky wilds, wilds, scatters and bonus rounds. Symbols are designed according to the theme of the game. While you spin the reels, you will find symbols like; cops, gangsters, classy ladies, crowns, necklaces, rings and sports cars. 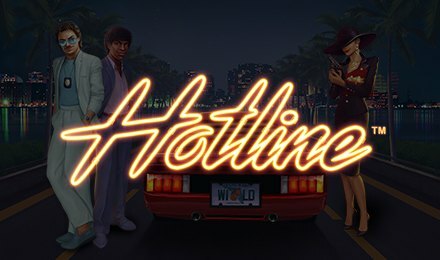 Enjoy Hotline slots and spin away. But before you proceed with spinning, set your stakes in the respective fields and this will make your gameplay easier. Use the Autoplay option to your advantage. This allows you to set a number of autospins to play on their own. Amount of Paylines Selection: All paylines remain active and cannot be altered. Coin Values: Set your stakes from £0.01 to £1.00. The wild card takes form of the red sports car. This symbol takes place of any other symbols, bar the scatter symbol to help complete winning combinations. Wild also expands in the bonus round of the game. Win big with expanding wilds and respins in the Hotline Bonus Bet Feature. Hotlines can be activated or deactivated according to your liking. But one hotline is always active. 1 Active Hotline - Played at a 15-coin bet. 2 Active Hotlines - Played at a 30-coin bet. 3 Active Hotlines - Played at a 45-coin bet. If a wild symbol lands on a hotline, it expands to cover the entire reel and awards a respin. The expanded wild then turns sticky and remains intact for the duration of the round. Land 3, 4 or 5 scatters on reels 1, 3 and 5 at the same time and receive 7 free spins to play. During the Free Spins Feature, when wild symbols land on hotlines, they expand to take up all positions on the reel and become sticky.